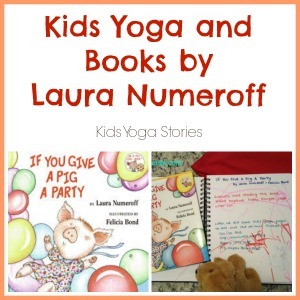 This month for Virtual Book Club for Kids, we are spotlighting books by Laura Numeroff. If You Give a Mouse a Cookie was my first favorite Laura Numeroff book to read in the classroom. Check out Laura Numeroff’s official website to see all her charming and fun books for young children. Our daughter started a new Toddler School in December. On her second week at the school, she was given the home-reading pack to do some book activities together as a family. 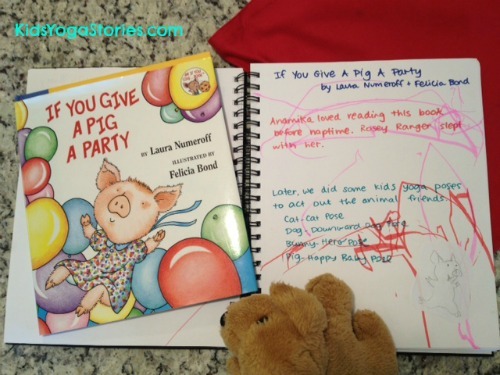 The red book bag had the If You Give a Pig a Party book, a stuffed dog named Rosey Ranger, and a journal to record our experience. After reading the book together a few times, we decided to do some yoga poses to represent Pig’s friends. It was a great way to bring the book alive with movement. Then, we talked about each of the animals and pointed them out on each of the book pages. Try acting out the animals in the book too! Don’t worry if you haven’t tried yoga before. Just jump in and give it a go. The focus is on having fun with movement and story, not on perfectly aligned poses. For images of the poses, see our list of Kids Yoga Poses. Are there other keywords in the book that you can act out as well? What is your favorite Laura Numeroff book? If you have blogged about it, we would love for you to link up your post in the linky below. Numeroff books are great read alouds. I especially love the lesson plans around her books listed at Readworks.org. Do try them out if you haven’t! Giselle you always share the funnest ideas for ways to involve yoga with books ! 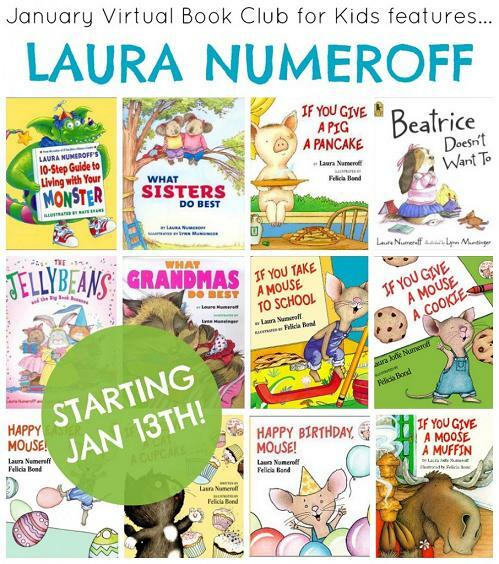 Thank you so much for sharing and hosting the Virtual Book club for Kids this month featuring Laura Numeroff! Thank you for popping in, Reshama and Kim! I love books that we can extend the learning experiences and make meaningful connections for our children. See you next month for more Virtual Book Club for Kids!